One of the red flags of the patriarchy — men misusing and abusing their power. But, remember! Women are part of the patriarchy, too. As women start claiming more power in our public world, let’s not make the mistake of thinking it’s only the men. We women misuse and abuse our power, too. Sometimes in public life. Sometimes in private. In my favorite TV interview after I wrote my book, Power Abused, Power Healed,* I talked with Steve Adubato about women and power. People expect men to abuse power. But with all these women in power now... what will they do with it? In essence, I confirmed that men have misused and abused their power – in government, in families, and elsewhere. And that their abuse of power has been more “out there” than women’s abuse of power. But what seemed most important to tell him: if women are at home with the children after the father goes to work, or whenever the mother is with the children alone … it is the women who are in power. They have all the power. And whatever they, the mothers, experienced in childhood, whatever the mothers decided in childhood … all that can be acted out with the children—in the nursery, in the bathroom, in the kitchen, in the playroom. Steve’s response: A lot of power! My elaboration: That one mother’s child may grow up to be a president or a dictator. That one mother can have more power – as much if not more power, if you think of the child’s formative years – than Hitler. In other words, one mother can contribute or co-contribute to a child’s becoming a terrifyingly destructive adult – citizen or leader. This means that not only the fathers but – sometimes equally and sometimes even more – the mothers and their childhood experiences in the face of power have an extraordinary impact on how power is used by leaders and by citizens in our country and our world. Both the acting out and the impact can be conscious and unconscious. As a result, we each need to explore within and heal to the roots … whatever misuse and abuse of power we are prone or programmed to re-enact within and without, as a result of our experiencing the same with our parents and other elders in our youth. If we don’t do that healing work, we will re-enact our own experiences and collude communally – with our families, our companies, our organizations, our communities, our world – to co-create misuse and abuse of power in our world today and tomorrow. Mothers will act out with their children their own childhood experiences with people who were in power with them. This is exactly what we’ve seen with the men . . . who act out with their children as well as in their other relationships, personal and public, their experiences with those in power with them, when they themselves were children. So … how many men do you know who have done their own inner healing work with their experiences with people in power and with their own resulting relationships with power? How many men who are fathers, husbands, employers, politicians, government officials, and more? And how many women do you know who have done their own inner healing work with power? How many women who are mothers, wives, employers, politicians, government officials, and more? If we women want to take a larger, more active part in the healing of our country and our world, we need to do it differently than men … not only in the outer world, but also in our inner worlds. We need to do our own inner work with the experiences we had as children with those in power … and with the resultant relationships with power that we have created in our lives – inside and out. If we women fail to do our inner work … whatever we do in the outer world, we will be unable to make the changes we claim we want to make and sustain them. That can only be done from the inside out. * Power Abused, Power Healed, Judith Barr, Mysteries of Life, 2007. Note: Not all people misuse and abuse their power as obviously as others. Not all people misuse and abuse their power as much as others, or as obviously impactfully as others. But there is a current of misuse and abuse of power in each of us. In some, that current is huge, like a huge flooding river. In others, that current is not as large, but however large it is … it has an impact on us and on our world, inside and out. That means we all need to do this work! And just to be clear . . . there are both men and women who do this inner healing work… just not nearly enough of either. we make resolving them less and less possible. and the possibility of resolution seems to disappear. At this point we may close the door to our self-examination, to searching within and to true solutions. We may find or create distractions, even distractions that appear to be kind, giving, and helpful. For example, charity can help someone, but that doesn’t erase the underlying wounds and fears that live in the darkness within us. Or, activism can be important in our outer world, but that doesn’t erase the underlying traumas and terrors that live in the darkness in our inner world. Or we may add hype to the fear, use it as a turn on, and help someone make money off it – as with horror stories and movies. This brings fear more out into the open, but doesn’t bring our particular fear out in the open. It doesn’t get to the real roots of our fear; it doesn’t help heal our fear; and it doesn’t help transform our relationship with our own fear. Most important – our relationship with it. to ourselves and to others. That means so much of us is in the darkness. So much of us is in the unknown. Why would we turn away from discovering ourselves? Our wounds, traumas, and fears from long, long ago are found in the dark underground labyrinths within us … and are also triggered by the darkness in the world around us. The world up close in our everyday lives. The world out there that we know nothing about, and the world out there that we witness on tv, the internet, radio, and social media on a daily basis … for some of us all day long. What too many of us don’t know: our unacknowledged, unworked with, unresolved wounds, traumas, and fears within contribute to the darkness in the world all around us. They help feed it. They help grow it. They help escalate it. Once, long ago, we were innocent victims, traumatized in ways we should never have been traumatized. That was not our responsibility. But if we grow up and don’t take responsibility to heal our own ancient traumas, we are no longer victims. We become the victimizers. We create trauma from the trauma within that we’re holding at bay and hiding from. Back then it wasn’t our responsibility that we were traumatized. Now it is our responsibility to heal our trauma … whatever it takes. It is our responsibility to do the inner work to heal. Healing is an inside job. Healing is our job. We don’t know we can. and as many as you need to before that one. You will know we can. But I’ve seen it. I’ve helped make it possible. I know for a fact that it’s possible. We’re afraid to try and fail. But the only way you fail is if you give up. The trying with commitment brings healing. The trying with giving up does not. The giving up actually brings more pain than the staying committed. We don’t want to do the hard work. than help the child within us heal. than help the little one still alive within us heal. within, with others, and as we witness others in our world repeating the same thing. calling us to heal from the inside out. we’d rather avoid the real pain, the soft pain at the root. the false pain, the hardened pain of our defenses. People are doing this all over our world – in the north, in the south, in the east, and in the west. Acting out their early suffering on themselves and others alike. Acting it out blatantly or subtly. Acting it out consciously or unconsciously. Who in the current scenario is like your father was? Who like your mother? Who is like your brother or sister? Who like your childhood clergy person or a teacher? Who like a neighbor? Who like the image you had of yourself when you would grow up? I’m not a betting person, but on this I would bet. Together we could talk — for the sake of healing — and discover what from your early life is getting acted out and what from your early life is getting triggered on today’s political stage. If those in government would be willing, together we could talk – still for the sake of healing – and discover what from their early lives they are acting out and what from their early lives is getting triggered on today’s political stage. These talks and explorations could occur anywhere in the world: in the US, in Great Britain, in Europe, in the middle east, in Africa, in South America, in India, Russia, China, Japan, Australia, and more. All over the world. We are all in this together. And we are all creating it together. Just like in any family … Everyone of us who does nothing to find out the consequences of our own trauma on our lives and our world today … keeps creating it, keeps co-creating it, keeps enabling it, keeps colluding with it … keeps feeding it, keeps driving it to continue and to escalate. Just like in any family … Everyone of us who starts to explore what it is in us that is involved today, and who begins to heal whatever that is … begins to end our collusion in and contribution to the ugliness, the chaos, the destructiveness, and the trauma that is right in front of us and all around us. This is the hope. Are you going to be someone who stands up and sits down? Someone who stands up and then walks away? Are you going to be someone who stands and stands and stands? And walks and walks and walks? May you be someone who stands and stands and stands. May you be someone who walks and walks and walks. ** How Did We Get Here? Our Refusal to Know the Truth About Ourselves, Judith Barr, Mysteries of Life, 2018. Note from me to you: If you want to know more … let me know. If you want to know more, come explore with me. Memories that aren’t yet conscious. Memories they don’t even know exist. The darkness has been cast as bad, even evil. lack of attachment, and rupture. and the cause of war. or feeling inadequate and depressed because we can’t or don’t. both in their families and terribly isolated from family and any one. we come face-to-face and heart-to-heart with the darkness. reveals our real relationship with the darkness. it is a gateway to healing unlike any other. and are triggered by the darkness in the world around you. the treasures of healing waiting for you are limitless. a new kind of light – an inner light – unlike any you have imagined. Remember … trying to escape from the darkness at all costs makes healing impossible. The cost is the loss of the healing. a possibility unlike any other. This is the work I do with people every single day. Not just in the approach to and through the Winter Solstice. and touching, miraculous new birth from the inside out. For Part Two … stay tuned. We are haunted. Not only on Halloween, but every day of the year. Not only every day, but every month. Every year. Every decade. Every century. … we will continue to create and escalate destruction and trauma for ourselves, our children, and each other. … those who come after us will be haunted not only by their own personal ghosts, but also by those of their ancestors – us. that we refuse to heal. and are still alive within us today. for we, ourselves – inside and out. for those around us, close by and far away – inside and out. for those in our communities, neighborhoods, nations, and planet. to us, to our families, to our societies, to our world. that is driving us – too often destructively – both subtly and blatantly in our lives. to heal the trauma we carry with us from our own past. WHAT YOU CAN DO TO HELP HEAL THE HAUNTING? *You can read How Did We Get Here? My recently published book that explores our haunting by trauma much more deeply. It can help you in many ways, including … informing you and helping you reflect more deeply. *You can work with me individually. If you are able to do in-person sessions at least periodically, and live in Connecticut, New York, or Florida and can do phone sessions for the remaining sessions . . . we can work together towards your healing your trauma. *You can work with me in community. I lead a group of women who meet on a monthly basis, who have worked deeply and committedly for years to heal their wounds and traumas to the root. These women know that they are not only doing their own healing, but are also participating in the healing of our country and our world. They know the real healing needs to be done from the inside out. 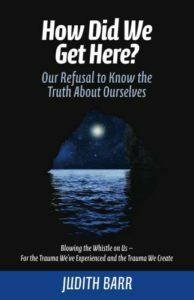 They know the truth – that every one of us, even if we don’t blatantly act out destructively, plays a part in the destructiveness that is occurring and escalating today. They know the reality that we all are part of the patriarchy, and they are working to heal the patriarchy within themselves. They are unique, self-responsible, integritous, caring women, passionate about doing their own healing work, and aware of how combining individual work with this group work multiplies boundlessly both the support and the healing. They would welcome new women to join this safe group — women who have these same qualities, intentions and the commitment and longing to heal and help heal. This group is certainly one that fits Margaret Mead’s description of a group that can change the world. Thomas – Hill. Kavanaugh – Ford. Republicans – Democrats. Men – Women. This isn’t just a Supreme Court nomination. Most people realize that. This isn’t just a political conflict. Many people realize that. This isn’t just the fight of many women and some men to end misogyny and bring about healthy, respectful, human, heartful treatment of women by men. Many more people are realizing that. And this isn’t just the insistence that women who were sexually abused be heard, believed and not blamed. Some are coming to that. More are coming to that. this is a window to the soul of our culture. A window that has been closed and locked. as if to keep a storm in the outer world from blowing it in. hidden on the inside, kept secret, and buried deep within. This window is now being blown from the inside out. Where we have been hiding the trauma that lives deep within our culture. Where we have built on top of that trauma layers and layers of defenses. where our children are born, live, and develop in trauma. To an eye and a heart of someone who works with men and women who have been abused, neglected, and sexually abused as children, this whole process of Brett Kavanaugh’s nomination and hearings, is a clear out-picturing of what goes on in a family in our country where one or more of the children have been sexually abused by an ”authority” in the family, and where even one of those children tries to tell the truth. To the eye and heart of someone who has for decades worked with the early trauma of men and women, I can see how that trauma is out-pictured in their own lives. And I can see how that trauma is out-pictured in the life of our country and our world. In the recent Senate Judiciary Committee hearings, I could see the early trauma of many of those who spoke. Some might not have seen angry outbursts and defenses as signs of early trauma. They might cover the real explanations and understandings with justifications and normalizations. But I know what I saw. And I saw the trauma beneath the boarded-up windows and doors. The steps that have been taken to listen with respect to Dr. Ford and others who have been sexually abused … are, indeed, important steps. But they are not enough. They are not nearly enough. the trauma to Dr. Ford and any others sexually abused by the nominee. the trauma to others who have come forth and may come forth about the sexual assaults they have experienced. and other assaults – every day in their homes. And the trauma to the others in the picture. The trauma to those who witness the assaults. The trauma to those who react to the assaults. The trauma to the family in which the assaults originally happen. The trauma to those who commit the assaults. or the assaults would not have been committed by that person. while believing they are something else. while being unaware of our complicity. This article describes just the tip of the iceberg of the depth exploration revealed In my recent book – How Did We Get Here? * – on the heart of where we are in the life of our nation and our world, and what is here for us to see and heal in our country … and in countries all over the world. The relationship between trauma and accountability is woven throughout the book. *Barr, Judith. How Did We Get Here? (Brookfield, CT: Mysteries of Life, 2018). Available through Amazon or JudithBarr.com. publication of my new book. The responses were meaningful, touching, heartful. “birthing” How Did We Get Here? I hope the backstory will be meaningful to you, too. from my first sentence to publishing. It was a learning, growing, profound sacred journey. At the same time, it was a wild ride … and I was pregnant with my book for 7 years. deepening in ways I knew, and also in ways I didn’t yet know. For the first time in my life, I had written and published a book. (and some tv and print media). For the first time in my life, I became a trusted source for some media hosts. and how delighted they were that I wasn’t speaking “therapese” to the audience. our own relationships with power. beneath what most people know. what is driving us to be the way we are? if we don’t know where we have gotten stuck in our growth and development? so we can pretend – to ourselves and others – that we have moved on? People kept asking me when I was going to write another book. The ‘no’ was really to another 7-year pregnancy. But my muse and I couldn’t stop writing. So I wrote my monthly blog from 2009 on. between our healing as individuals and our healing communally and globally. a way that was not available to me previously. A tornado hit my town, my neighborhood, and my home. That experience opened me on a heart and soul level in ways I couldn’t have imagined. “took me to the computer,” started “dictating,” and told me we were writing a book. She didn’t say how long the pregnancy would be or wouldn’t be. There was no ‘no’ at all within me. Only ‘yes’! ourselves, our countries, and our world. were asking how we got here. that were driving us individually and globally. at the deepest levels possible. I felt I could help people understand on those very deep levels. Much more quickly than I could have imagined! both of my books into their language(s). so I can help my book have the greatest positive impact possible. I welcome any inspirations, connections, networking you can share to this end. to help us all become more conscious …so we can heal ourselves and our world. is what is written on the back cover. So many of us even believe we know. our answers barely scratch the surface. are in the condition they’re in. People have all sorts of explanations for how we got here – nationally and globally. It’s financial. It’s political. It’s patriarchal. It’s prejudicial. It’s misogynistic. Yet … they are all accounts at or near the surface. none of them reaches the roots of the way in which we got here. that there are root causes deep beneath each explanation. And none of them even hints at the central reality that underlies all the explanations. So … how did we get here? again the wounding and trauma we experienced as children. More of us than we know were wounded long, long ago. affecting us, those close to us, our country, and our world. Imagine if everyone made the commitment to explore and heal those roots in themselves! Find out more and be part of the healing. Hoping if you are inspired, you will pass this along to others as a way to help in the healing. You can order my new book now! It is not enough to respond to the trauma on the outer level. It will not be enough until we respond to it and heal it deep within ourselves. Today is the day of the Summer Solstice – the longest day of the year in the northern hemisphere of the earth. The day that shines the most light on everything we need most to see and feel. At this time in our world, we need to shine the light on trauma. The United States is shining a light on trauma right now as a result of the heart-breaking, tragic, traumatic separation of children from their parents at the border … and the caging of children who have been taken away from their parents. Children, toddlers, babies, infants pulled away from their parents under a guise. Under the guise of bathing them. Under the guise of a law. Under the guise of an immigration policy. Under the guise of protecting our country. Under the guise of politics. No guise at all can really hide the truth of what is causing this cruel travesty! This is the out-picturing of the trauma experienced in childhood in the U.S. The trauma experienced in childhood that is still alive in people as they grow into “big people” … but not really adults … just big people defending against their childhood trauma, while acting it out in some way today. This is the result of trauma: the trauma in those declaring, directing, supporting, justifying, and carrying out these excruciating, traumatizing acts. It is the result of trauma in those witnessing these monstrous things. It is the result of trauma in those who get pleasure out of watching it – up close and from afar via the media. It is the result of trauma in those who do nothing about it. It is the result of trauma in those who protest it, too. What’s being done to the children and their parents at the border is traumatic to both. *It is the result of trauma in those declaring, supporting, justifying, and carrying out these excruciating, traumatizing acts. No one could declare and direct that children be taken from their parents and caged, unless they had themselves been traumatized as children. For example, taken from their parents’ arms; never able to truly bond with their parents; experienced some rupture to the attachment with their parents; or distorted efforts to achieve sought-after attachment with their parents that remained unsuccessful (like idealizing their parents or blaming themselves). That kind of childhood trauma, unhealed, would very likely result in people acting out the trauma that they experienced on someone else – another child, a pet, or some one vulnerable and powerless at their hands once they became a “big person” (like they once were at someone else’s). No one could cage children (or cause them to be caged) unless they themselves had been literally or figuratively caged as children, or witnessed that happening to others. Many people . . . more than most of us want to realize … grow up in homes where they experience abuse, neglect, some form of trauma, and as a result of how young and powerless they are, they feel caged, trapped, imprisoned. They spend their young psyche’s energy trying to get out, trying to never get caged again, trying to trap someone else instead of their being trapped, or maybe even trying to help others get free from their own emotional cages. *It is the result of trauma in those witnessing these excruciating, traumatizing things. Many of those witnessing the trauma to children and parents at the border today also witnessed children in their families, extended families, and neighborhoods being traumatized long ago in their youth. That is traumatic to a child in its own way, different from experiencing the separation or caging directly themselves, but traumatic nevertheless. They may well respond the same ways today that they did as children long ago when they first witnessed the trauma. *It is the result of trauma in those who get pleasure out of watching it – up close and also afar, via the media. No one could get pleasure out of watching children being ripped from their parents’ arms or put in cages, unless they had experienced the same literally or figuratively when they were children. And perhaps experienced the sadistic pleasure of the one who had done the ripping or caging with them. The justification for the abuse: “if you didn’t cross the border into our country we wouldn’t have to take your children away.” This is the catch phrase of the abuser. “If you didn’t x, I wouldn’t have to y.” Or “if you did x, I wouldn’t have to do y.” And those giving these justifications are not only exposing their abusiveness, they are also revealing the abuse in their childhood by acting it out on others today. *It is the result of trauma in those who do nothing about it. No one could refuse to do anything at all about children being ripped from their parents’ arms or put in cages, unless they had somehow experienced abuse themselves as children, and were afraid to do anything from a child place within, or were numbed out by today’s mirror of what went on in their own young lives. *It is the result of trauma in those who protest it, too. Thank heavens there are people protesting the policy and actions today, in 2018. Thank heavens there are people who are in the process of working to stop these traumatizing practices at the border. Perhaps those people are protesting today as they wish someone had protested for them when they were children being traumatized. Perhaps those people are protesting today as someone did protest for them when they were abused as children. And … perhaps those people are doing something in the outer world, but are not doing the underlying inner work they need to do about their own experiences of childhood trauma. In other words … whatever is occurring in the outer world today in 2018, even people trying to help these children and parents at the border, there is a dearth of people looking at, owning, taking responsibility for, working to heal and transform from their own early trauma. The result … the trauma that lies suppressed or repressed deep within haunts us forever till we do our own healing work. And the result … the trauma that lies within ends up – with or without our awareness – erupting and creating more trauma in the outer world. * If the abuse continues today, people can continue to use the coping mechanisms and defenses they developed as children, in an effort to protect themselves when they were first abused. *And if the abuse continues today, people can continue to hold at bay the feelings they experienced when they were going through the early trauma that was so much a part of their early development and their early lives. If they hold the ancient trauma at bay, they can pretend they don’t feel it, even though they do, beneath their awareness. If they hold the ancient trauma at bay, they can function as though it doesn’t haunt them every day. If they hold the ancient trauma at bay, they can pretend – even to themselves – that they didn’t have any part at all in creating the traumas that are right here in our world today. And they can continue creating and recreating the cycles for themselves and others to be traumatized today and tomorrow by the traumas each of them felt once upon a time long, long ago. There is so much more I have to say, but for right now the essence is this . . . The trauma we are increasingly experiencing in our country and our world today is not caused by some single leader or some handful of leaders – although they are certainly doing their part in creating the trauma today and tomorrow. The trauma we are increasingly experiencing is caused by us . . .
All of us, each of us. or know that we will continue to create more and more trauma in our country and our world. Look at the out-picturing we are being given of the children and parents at the border. Find someone – a committed, integritous, depth psychotherapist – who does their own work healing their own trauma and engage them to help you with yours. Do your own healing work.